April begins with a little pause, followed by a fascinating mix of increasing speed and energy punctuated by wakeup calls and “aha!” moments. Later in the month, we’ll have an opportunity to get some perspective on all our rushing around in the early part of April as we enjoy more quiet moments and a bit of introspection. Also, your April monthly horoscopes are up. Check out your April 2019 monthly horoscope to see how April’s astrology will affect you. Although we’re starting a new astrological year, thanks to the Sun’s passage through Aries, the first few days of April will feel quiet because we’ll be in a balsamic Moon phase that favors introspection over taking action. 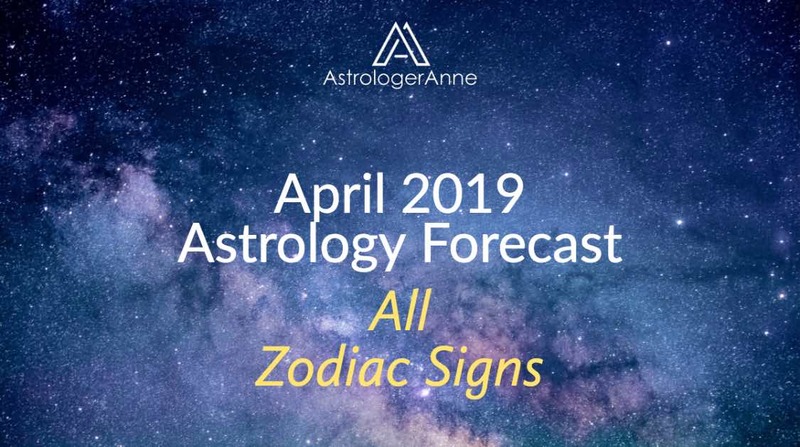 For the first three weeks of April, the Sun will move through Aries, the first sign of the zodiac, starting our new astrological–and spiritual–year and pushing us to get going again. A new Moon in Aries on April 5 will help us get moving by kicking off new energies for making fresh starts. Mercury, the planet of communication, will speed up after last month’s Mercury retrograde and play a major role all month. A full Moon – the second in a row in love and partnership oriented Libra – will arrive April 19 to grant us more insights on key relationships. The Sun and Venus will move into earthy, peace loving Taurus on April 20, turning our attention to practicalities (and encouraging us to “stop and smell the roses”). Three outer planets will turn retrograde, giving us subtle nudges toward introspection and improvements. Usually, April feels like a great time to push ahead on projects, thanks to the Sun’s annual journey through fiery Aries, which loves new beginnings. From April 1 through 5, however, the Moon will be at the close of her monthly cycle as she moves through the balsamic Moon phase. This mysterious phase brings a dreaminess and quietude that’s best used for meditation and reviewing the past month. So put off all those things you want to launch for just a bit longer because if you wait for the new Moon on April 5 you’ll feel much more ready for action. Sun And New Moon In Aries – Let’s Go! Last month, on March 20, we experienced the annual Aries equinox when the Sun left Pisces for the sign of the Ram. This shift signals the start not only of a new astrological month but a new season (spring in the northern hemisphere and autumn in the southern) and a new astrological (and spiritual) year. Aries energy fires us up to start anything we desire. In March, though, Mercury was retrograde nearly the entire month, which made it tough to begin anything new. Our best course was tackling old business and tying up loose ends. Now, we really can have those great new beginnings. As of April 5, the Moon will join the Sun in Aries, starting a new lunar cycle and uniting our hearts and heads so we can take action so much more easily than we could last month. So whatever you’ve been wanting to launch, go for it now! You have two weeks – until the full Moon April 19 – to move mountains through passion and sheer force of will. After being retrograde nearly all of March, Mercury will get back in stride in April. Hooray! Although none of the planets actually move backwards, when they’re retrograde they look like they are as seen from Earth. These times of apparent backward motion coincide with slowdowns that affect us (often dramatically). So when planets appear to move forward once again, it’s cause for celebration because our plans can move forward again, too. It takes a little while for planets to get back up to speed after a retrograde. In the case of Mercury, this planet will be back to full power on April 17. The day before, Mercury enters Aries, a place that’s more comfortable for this highly intellectual planet than Pisces (where Mercury spent extra time due to last month’s retrograde in the sign of the Fish). April 2: Mercury meets up with Neptune in Pisces once again, sparking ideas related to arts projects, spirituality, health, and serving others. April 7: Mercury aligns helpfully with Saturn, giving support and better structure to plans and projects. April 10: this planet links with Pluto in Capricorn, bringing potential for help from important people or greater power through ideas that empower, organize, or streamline. April 11: Mercury makes a challenging angle to Jupiter, helping us question our beliefs and change our thinking related to travel, health, higher education, the arts, or religion. April 16: this planet moves into Aries, revving up our minds to compete (and win! ), try something new, or lead the charge for a cause we care about. April 30: Mercury links to Mars, which rules Aries, putting more energy into ideas and increasing passion for debate and attraction to amorous adventures. The Sun will leave hot blooded, action oriented Aries on April 20 when it enters Taurus. The sign of the Bull offers a major contrast to Aries’s energies. While Aries has a hard edge at times (being ruled by iron willed Mars), Taurus has a softer feeling because it’s ruled by loving, peaceful Venus. This zodiac sign gives us a chance to pause and be practical after all our Aries striving and rushing around. Taurus grounds us so we can stabilize whatever we start during Aries time – and make the most of it (and potentially make money from it). Taurus time is when we put what we have to practical use: selling belongings to raise cash, making our home more valuable by beautifying it, or turning work projects into things that help others and offer a return on our investment. Here in the northern hemisphere, Taurus comes at the height of springtime. So in between working on your home, enjoying a luxurious and leisurely meal or two, and savoring sensual pleasures (all highly Taurus pastimes), get outdoors to walk on the earth and smell a spring flower or two. Your body – and your psyche – will love connecting to the earth in these ways. And you’ll more readily recall the reasons for all your striving. Also, keep in mind that we’re in the early days of the new Uranus in Taurus cycle. That’s shaking things up for us all, and you may find you have some genius ideas already about how to enjoy Taurus energies. Watch Earth Day on April 22 for special insights because the Sun will join Uranus in the same degree of Taurus, lighting up new potential for practical technology and avant garde ideas to help the Earth and reinvent how we manage money and the material aspects of life. Find out more – and get your Uranus in Taurus horoscope – in my article, Uranus In Taurus 2018 – 2025. How did you do with last month’s powerful, emotional full Moon? It came on the equinox on March 20, in Libra. We’ll have a chance to revisit whatever came up at that time, thanks to a second full Moon in a row in this sign. If you need to make changes in close relationships or other areas of life linked to this sign, this full Moon will help by “popping” valuable information, helping us see (potentially uncomfortable) truths, and showing us new ways forward that benefit everyone and allow for greater peace and harmony. As the full Moon approaches, review marriage and partnerships of all kinds, peer relationships, and how you deal with competitors and adversaries. Also look at your involvement with artistic pursuits, beauty, and peace. As always, this full Moon (and the day before and after) will offer extra powerful opportunities for meditation and spiritual work. Use this time to go within and meditate about peace, your closest relationships, and harmony. In any case, the closer a planet’s orbit to the Sun, the more we tend to feel its effects in obvious ways, especially when it goes retrograde. In the case of the so-called social planets (Jupiter and Saturn, which help shape social structures) and the outer planets (Uranus, Neptune, and Pluto, which connect us to “out there” ideas and futuristic ideals), their retrograde motions last for several months. Although these planets’ retrograde periods don’t seem to wreak the same kind of havoc we experience with retrograde Mercury, Venus, and Mars, the fact that their retrograde last so much longer concentrates these energies and creates changes at deeper levels. Jupiter, turning retrograde in Sagittarius from April 10 through August 11. Pluto, turning retrograde in Capricorn from April 24 through October 3. Saturn, turning retrograde in Capricorn from April 29 through September 18. Jupiter and Saturn currently are moving through the signs they rule, making them more powerful and bold – and making these retrograde periods more significant than usual. In general, it’s helpful to note these periods and use them for a bit of gentle introspection about how you expand your life and consciousness, how you handle power, and how you live up to your responsibilities. If you need to change course or make some adjustments, now’s your time! Enjoy this month’s more outward energies, now that Mercury retrograde has passed. Start something new and put your passion to the test. Along the way, enjoy taking a pause or two from all your striving and pushing ahead. Slowing down at certain points will help you balance your life beautifully and rest a little so you can have more fun. See your April 2019 monthly horoscope now for your astrology forecast. You’ll find details on making the most of April’s astrology. Have a great time moving forward!